BASKETBALL SPOTLIGHT NEWS: Basketball Spotlight Feature: Lewis Enters MDC As #1 Player In America! Basketball Spotlight Feature: Lewis Enters MDC As #1 Player In America! The move to New Jersey has turned out well from Scottie Lewis. He has grown from little known talent in Georgia to a nationwide name since joining up with Team RIO National. Scottie's play on the court has earned him these accolades. He has led Team Rio to several championships including Basketball Spotlight Tip Off Classic, MLK Classic, MIT and NJ State Championship. Ty Kish from Middle School Hoops, the best video site in the country just released his Top 10 and he has Lewis at the #1 spot. Team Rio's director Brian Klatsky has been with Scottie since he touched down in the Garden State feels he deserves all the attention he receives and he won’t be fazed by the #1 ranking. “Scottie has been working hard since the day he arrived in NJ. He knows that there is a target on his back being highly ranked and it drives him to be work harder. Not only has he improved his game since arriving in NJ but he has elevated the game of his Rio teammates” he finished. Basketball Spotlight would like to congratulate Lewis on his recent success but also let him know that the road is very long and he must continue working. 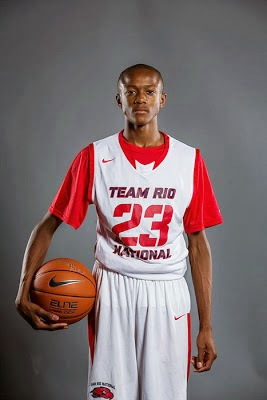 You can check out Team Rio National at the Basketball Spotlight MDC May 24th and 25th. Marvin Bagley III Receives "The Stamp"
Grand Finale Point Total Update! What Did We Learn From The AC Showcase? Basketball Spotlight MDC Gets Early Attention! Taylor and Quinerly: Best Backcourt In America? AC Showcase Is Sold Out! AC Showcase Flashback: Lets Get It On! Nobal Has Game For Days!